Those driving from Newton to Peabody can soon expect the length of their trip to be more than tripled. That is, if they take the state’s recommended detour. The Kansas Department of Transportation announced Thursday that it will be making repairs over the next two months to Bridge 58, a bridge on Highway 50 that spans I-135 in Harvey County. “This bridge isn’t known as Dead Dog to KDOT but Dead Man’s bridge,” Harvey County Road and Bridge Director Jim Meier said. “They’re going to make deck repairs to it. The repairs are expected to close down the bridge, along with eastbound Highway 50 traffic, and open up a more than 50-mile detour for the 28-mile stretch of state highway. During phase one of repairs to the bridge, which is set to start Monday, July 16, the bridge is expected to remain open. The bridge will be closed during phase two of the repairs, which is set to begin Aug. 20. It is expected to reopen to traffic Sept. 24. In total, repairs will last approximately 70 days. The detour, which was established by KDOT, would add close to 43 miles to the normally 17-mile trip across county lines from Newton to Peabody. This amounts to close to an hour of additional drive time each way. This detour is not the closest route between the two cities. 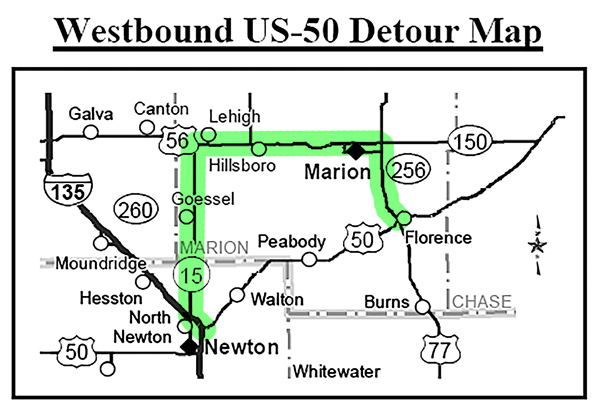 Using county roads, not recommended in the KDOT detour, the trip could be cut down close to its original distance. “They have acknowledged what they do with traffic there’s going to be some traffic on county and city streets,” Meier said, adding that KDOT offered the county $20,000 for damages caused by traffic during the project. Some Harvey County Commissioners at a recent commission meeting discussed rejecting the money from KDOT, arguing that the $20,000 was just an insurance policy from KDOT. Harvey County Anthony Swartzendruber explained that the county could either take the funding or have no recourse should traffic changes during the detour cause damages. Harvey County Commissioner Chip Westfall recommended putting sheriff’s officers on extra patrol along the route to prevent large trucks from trying to use roads they shouldn’t be using. He also recommended asking the state to provide some troopers during the detour. State-recommended detours utilize only state highways, even if there are shorter routes along the way. “If they see deputies, they might back off a little bit,” he said of trucks looking to take short cuts. The entrance from Highway 50 onto Main Street in Walton will also be barricaded during the project to protect the town’s road. Deb Gruver, a spokesperson for KDOT, said the state avoids rerouting state traffic onto city or county roads. Still, Harvey County is expecting an increase in road use for shorter routes along the detour.